Yes, today is the day. We set about trimming the tree. Can't you smell the lush fragrance of the pine needles? Look how tall and full that tree (Scotch pine if you grew up in my family!) looks. I've already worked on untangling the lights and checking the bulbs. Don't you just find that job so frustrating? Thank goodness for the mulled wine. The ornaments in their musty old boxes have been pulled down from the attic. And with everything in its place, its time to start decorating. I like to add a new ornament or two (or more) every year. Tree decorating is an exercise in evolutionary design. So this year, I have been eyeing up some lovely new handmade ornaments. 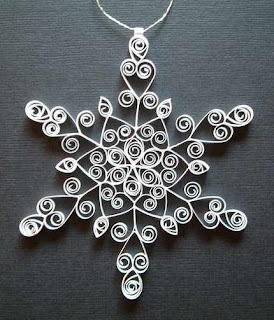 The first is a beautiful snowflake ornament made from quilled paper. This wonderful item was handcrafted by ForeverFiligree. 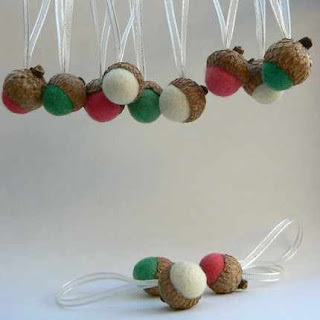 I also adore these teeny felted acorn ornaments. Crafter, Fairyfolk, uses real acorn tops! 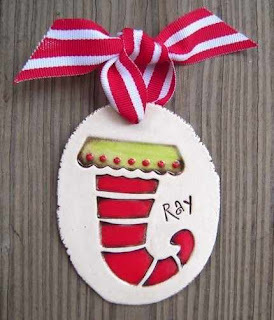 This ceramic stocking ornament from mudhut is undeniably cute. Because it can be personalised, its good for your own tree, or perfect as a sweet gift for someone else's tree. 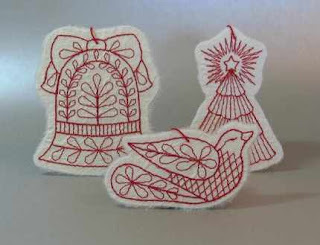 I am completely in love with the Old world charm of these embroidered ornaments by personalthreads. How glad I am that I tripped over this shop. Of course, every well-dressed tree needs a garland. 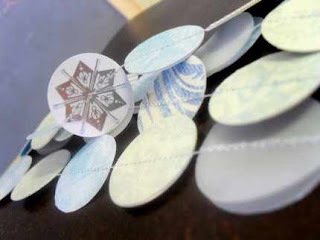 I love this wonderful garland made from paper discs. It is crafted by AllieRuth. And finally, the one piece that no tree is complete without: the tree topper. I found a wonderfully whimsical and sweet topper in the shop of Middleburg. (Gosh, I so love this shop and could easily imagine decking all my halls in this seller's wonderful work.) 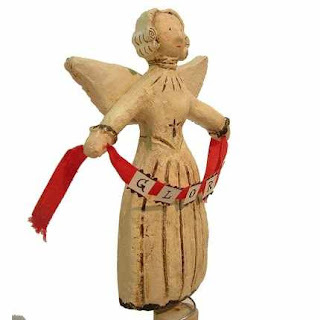 Look at this delightful papier mache angel's face... she takes her position atop the tree very seriously. That's our tree finished. What a fun day's work. Now to darken the lights, plug in the tree, and watch the lights twinkle. Grab a mug of steaming hot cider and curl up with me. Tomorrow, we will deck the rest of the halls. I love the acorns! Very nice.